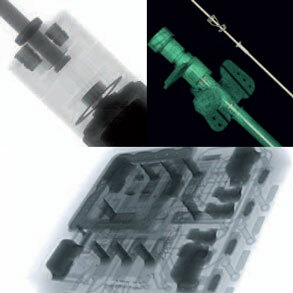 Micro-Focus Computerized tomography from Bookholt Associates X-ray and non-destructive testing equipment and supplies. Using industrial computed tomography systems flaws can be simultaneously detected and located in almost any material without destroying the object. The Y.CT Universal is a industrial computed tomography system which is developed for a wide spectrum of inspection items. The Y.CT Universal industrial computed tomography system permits inspection of large and heavy components. The Y.CT Universal system enables measurement of the internal and external geometry, which offers considerable help for the fast qualification of prototypes, monitoring of production processes and quality control in serial production. Y.Cougar is the product line of compact and ergonomic Feinfocus X-ray solutions especially designed for maximum versatility. Y.QuickScan – the ultra fast μCT solution. Easy to use, safe operation.